This 4-bedroom home-away-from-home is outfitted with your comfort, fun and convenience in mind. 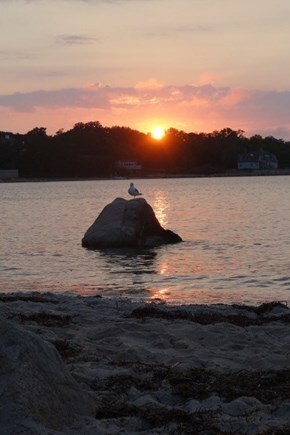 Walk or bike to the village of Woods Hole or beaches. Ride, skate, run or walk the Shining Sea Bike Path. Eat out on the deck (or grill your catch of the day!) while any young ones play in the yard. Play board games, watch a DVD, borrow a book, or challenge a friend to Foosball. Our kitchen was completely redone in 2012, and has a gas stove, fridge with ice maker, dishwasher, Keurig coffee maker (and a multi-cup coffee maker), microwave, and everything you'll need to cook, bake and serve. 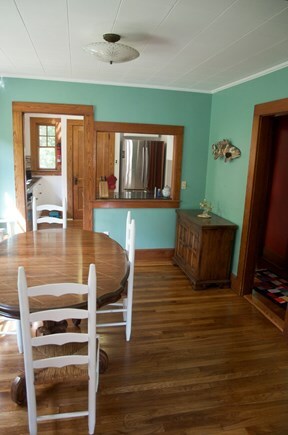 Our dining room table extends to seat 10 -- or eat at the picnic table on the deck. Other amenities include a washer/dryer, cable TV, Internet, a BBQ grill, and an outdoor shower. 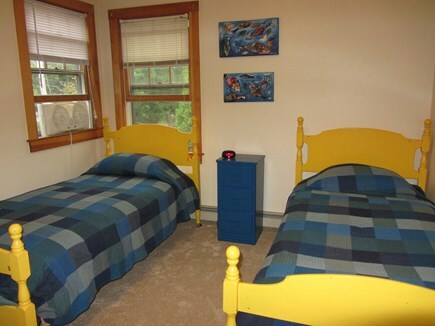 Three upstairs bedrooms (two queens, one with two twins) and a downstairs bedroom (twin bunk beds) and two full baths (both recently renovated) ensure plenty of room and privacy for your group of up to 8. We even have a pack-n-play if you have a young one in your family. Information on local attractions and restaurants is provided so you can plan your adventures. We enjoy the beaches, the bike path, day trips to Martha's Vineyard, and Cape Cod Baseball League games in Falmouth. Where will you explore from this comfortable home base? 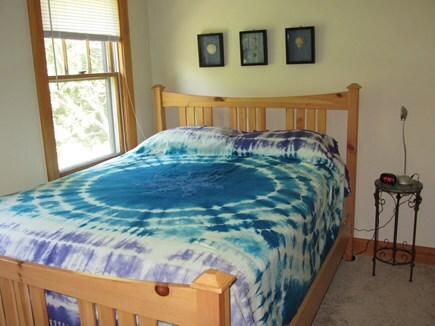 Long-Term Rental (1 month or more): Available early Sept - early June. $1475 per month. Contact us for further details. We've stayed in a couple of places in the area, and this is one of our favorite houses for family use -- it has a great layout and bedroom configuration; well equipped kitchen and yard; beautiful, big porch with hammock for lazy afternoons or outside meals; and a quiet cul-de-sac location with basketball hoops for the kids. 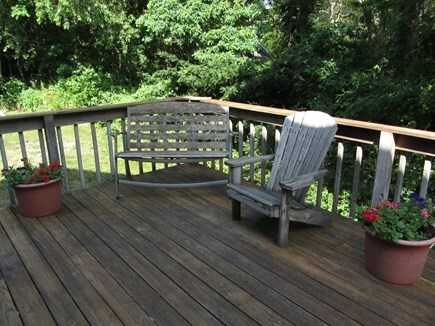 The house is 10-15 minutes walking distance to town, and has great access to bike path and beaches. Highly recommended! We'll be back. 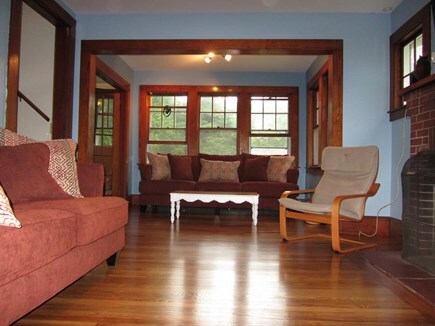 We are so pleased you and your family had a good time in Woods Hole and enjoyed our home. Come again! Perfect family getaway in Woods Hole! This Woods Hole home makes the perfect family getaway! 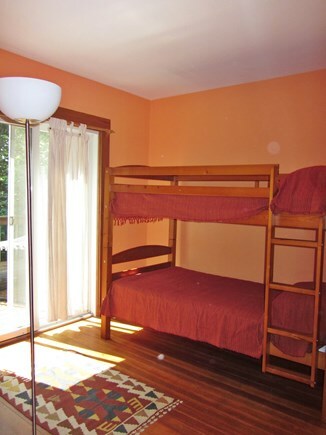 There is a lot of comfortable sleeping, eating, and living space for adults and kids alike. We enjoyed all our meals on the back deck, which includes a grill and a large picnic table. Clean up was easy with the compact but remarkably roomy dishwasher, an amenity we were grateful to have. The hammock quickly became a family favorite, and it’s big enough for two so our kids could share! The owners have thought of everything to make vacationing (especially with kids) easy: There are books to borrow, puzzles and games to play, and DVDs to watch on a rainy day. They also provide bikes, beach chairs, and other gear that is wonderful to have but difficult to travel with. On the basis of the owners’ recommendation (they provide a book of restaurant menus and local activities), we ordered pizza to be delivered to Stoney Beach at sunset – it was a highlight of our stay! We agree that pizza at Stoney Beach at sunset is a delight! 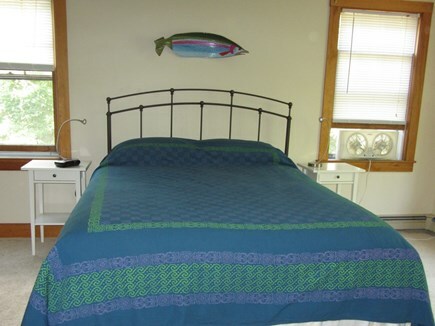 We're so glad you enjoyed your stay in our home and in Woods Hole. We look forward to your return! We love Woods Hole and have been vacationing here for years. Our favorite activities include bike riding along the Shining Sea Bike Path, stopping at Pie in the Sky for breakfast, and collecting (and then releasing) sea creatures at Stoney Beach. If Woods Hole is a new destination for you, we are happy to suggest things to do for people of all ages. 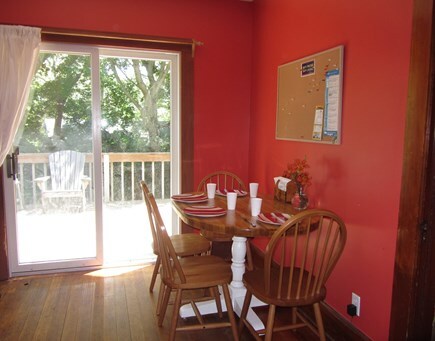 If you have been visiting Woods Hole for years, we are sure you will find our house a very convenient and comfortable home base! 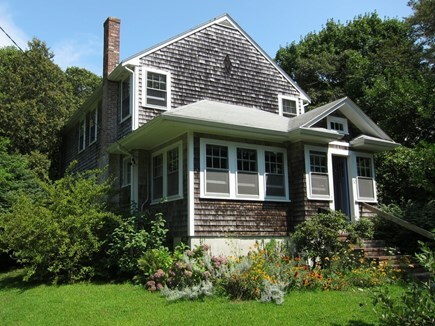 Our home is on a quiet, dead-end neighborhood street convenient to Woods Hole village, the beaches, and Falmouth. 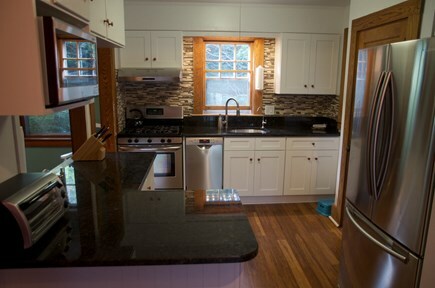 We remodeled the kitchen in 2012 and stocked it with everything you need. We love to grill on the deck and eat at the picnic table. We have bikes and beach/picnic gear for your use, and will write you a letter that allows you to get a beach parking pass if you want to explore the many Falmouth beaches. The beaches, Shining Sea Bikeway, Beebe Woods, the aquarium, and many other attractions offer unlimited fun outside the house; we also have Foosball, board games, books and DVDs for your enjoyment at home. We have two full bathrooms and an outdoor shower. A washer and dryer are in the basement for your use. If you have any questions about our home and the amenities, we invite you to be in touch! Woods Hole is a remarkable village. Enjoy the beaches, the restaurants, and the many science exhibits (including the aquarium http://aquarium.nefsc.noaa.gov/ and the WHOI exhibit center http://www.whoi.edu/visitus/). Hop on a ferry to Martha's Vineyard - an easy day trip - or watch the boats come and go into Eel Pond. There is a film festival every summer, and both Woods Hole and Falmouth offer lovely pottery and art studios. Cheer on the Falmouth Commodores at the ballpark, and hike in Beebe Woods. Explore a wide variety of beaches, including Wood Neck beach, which is an estuary with an incredible diversity of infant sea creatures. 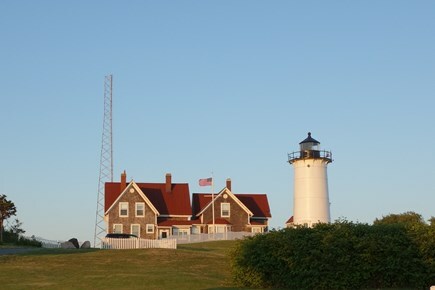 People of all ages will find delightful things to do in and near Woods Hole!